Let’s see…it’s like a iPhone, but it doesn’t have a phone…or a camera…or GPS…and some sites won’t render (Flash), but it costs 2.5 – 4 times as much as a iPhone. And Apple still hasn’t put multitasking into its devices. I know…right? Still no multitasking. 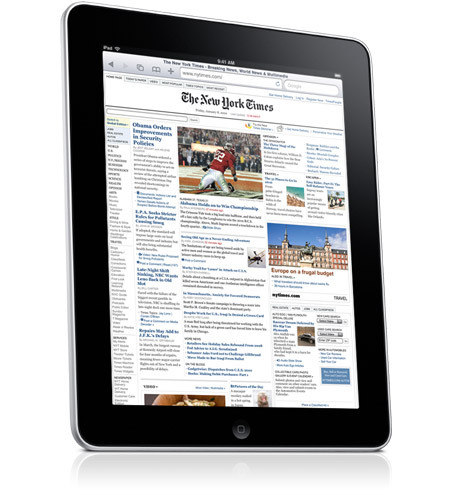 If you’re on the market for an ebook reader then the iPad is a strong candidate. I guess having an ebook would be cool, but I’d end up breaking that beautiful screen 5 minutes after getting it out of the box. (It looks super-fragile.) If I didn’t break it, I’d leave it behind on a train or plane. You do that with a book and you’re out $15. Do it with an iPad and your out $500-$800. Nonetheless, I will admit to a slight bit of screen envy. But iWon’t. Will you? Apple’s planned launch of their as yet unnamed tablet has gotten me thinking about what applications are going to prove to be the “killer app” for the new device. Recalling a conversation I had with a friend our answer was: retail. The tablet has an opportunity to make a big impact on how retailers interact with their customers. Let’s look at how the device could change how customers interact with the retailers before, during and after the sale. For purposes of discussion I’ll use Home Depot as an example. Normally before I head off to Home Depot I (hopefully) grab any returns I have and scratch out a list of items I need (along with measurements). Once I’m there wait in the excrutiatingly long line to make my returns and then I set off into the huge maze of football field length, sky-high aisles – hoping to find the products I need. Once I have the items I need I either stand in a long line with a human clerk or battle with the self-checkout system. In general, it’s a largely unpleasant experience that is replicated in some measure at many other big box stores (Walmart, Target, Lowes, Sports Authority, etc). So what could a tablet do for the customer? Before I leave I pull up the Home Depot app on my Apple tablet and it reminds me that I have items in the garage ready to be returned. It tells me that with the holidays over, I may want to look at some new storage and organizations products to make better use of the space in my home. It has some routine DIY project videos along with step by step instructions in case I’m trying to fix a leaky faucet or install an eco-friendly rain bucket. Lastly it allows me to enter in the items that I need either by typing them in a tradition shopping list and/or by searching and selecting products from their catalog. Now I’m ready to head off to Home Depot. Once I show up in the store, a Home Depot sales person greets me. They know that I have a lot of items on my list and that I’m working on a big kitchen redesign project. They also know how that I’ve spent a lot of money at their stores in the past 18 months and that they’d like to help me spend more of my money at Home Depot, not at a competitors store. As the sales person helps me find things, I’m scanning their UPC code and updating my total bill for the visit. With all my shopping done I say goodbye to the sales person and I’m ready to head to the door. My order is automatically charged to my credit card so I do not need to stand in line to check out. But before I get to the door I remember that I need some nails. I can’t remember where nails are in the store so I type in nails into my Home Depot tablet application and it provides walking directions to the hardware section of the store that has nails. I purchase those and I’m out the door. Once home I am able to check the rewards points I earned, rate and review the products I purchased and mark any products for return in case they need to go back. Apple’s tablet provides retailers, especially big-box retailers, some opportunities for innovation, to provide differentiated service and to build stronger bonds with the customer. The larger screen has the potential to be the tipping point that brings about several evolutions in software design and ultimately consumer experience. 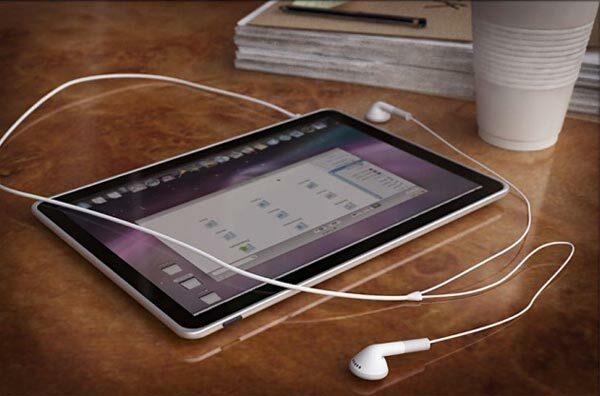 What do you think the tablet’s killer app will be? 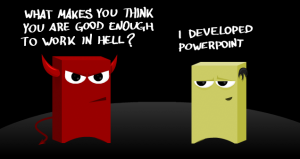 Let’s get it out of the way, Powerpoint presentations are not a great way to communicate ideas. This is especially true if you’re working on a group presentation. When creating a presentation in a group, team members have a very strong tendency to dump information into slides. This happens for several reasons, but mostly because they want to get their point across and using a lot of text allows them to be precise. As a result slides can quickly become “eye-charts” that are exactlingly correct but fail to deliver a concise message to the audience under the weight of text, bullets, embeded spreadsheets and the resulting charts. Write a report. Seriously. Not everything needs to be a Powerpoint presentation. If you need to communicate in detail, write a report and, if needed, summarize in an executive Powerpoint presentation. Use a simple agenda and structure: Tell them what you’re going to tell your audience, provide the information, summarize what they’ve heard, discuss, and finally next steps. Don’t read the presentation. The presentation should guide the presenter through the topics, not be a word for word reading. Follow the rule of three to keep things clear and simple. Create a voice over. A common complaint about Powerpoint is the .ppt file can be disconnected from the presenter. When the presenter is separated from the presentation two things are likely to happen. First, you lose the presenters voice tone and inflection and as a result emphasis and subtley is removed. Second, the audience may be unable to discern what the key points of the presentation are. Tools exist (i.e. Macromedia Breeze Presenter), and work exceptionally well, if you need to give an asyncronous presentation. Done? Edit! Once you “complete” the presentation go back and see if you’re presentation is supporting your goals. Strip out topics that don’t add value or may lead to distraction. Use appendixes! Hold to your key data, but provide them as appendices in the presentation. You can even link to the appendices within the presentation to allow the presenter quick reference to data if needed (rarely happens). Here are the essential thoughts from a recent Infrastructure & Operations conference. 1. Set a 100 day plan to get through these tough times. Focus on staff and culture; align with new business imperatives and seek efficiency through consistency. 2. Turn the economic crisis threat into an opportunity. Push for smart, cost saving projects that didn’t get green-lit previously. Cull your software and hardware herd. If you can tie efforts to cost savings, you’ll encounter less resistance in decommissioning legacy systems. 4. Be green. Save money. Save the planet. For example default duplex printing saves paper and toner. 5. Properly executed governance and advocacy programs can bridge the gap between IT providers and IT consumers. These two initiatives can bring business alignment, a happier CEO and a less stressful IT culture. 6. Virtualization continues to be a smart initiative and we’re just scratching the surface. Push your VM:host ratio to 30:1 or higher. 7. Cloud computing a few years to go before its proven itself but it well may be the manifestation of previously hyped efforts including utility and grid computing. When one looks at the math, it’s hard to see the cloud as just a fad.